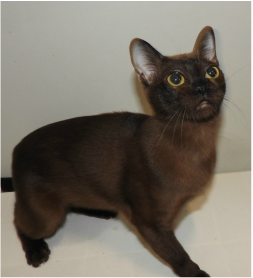 Current females in the breeding program are Kitakiss Mai Tai, a sable bombay; Panthat Dances with Fire, the blue girl pictured; Panthat Lady Serratia, also pictured, Panthat Fortune Cookie sable female; Panthat Sue She; Panthat. Also coming up kittens Panthat Jessie Morningstar, Panthat Marshmallow Daiquiri, and Panthat Angel Heart. This is Panthat Lady Serratia, called Sera. She was second best Burmese in the southern region 2015-2016 season.